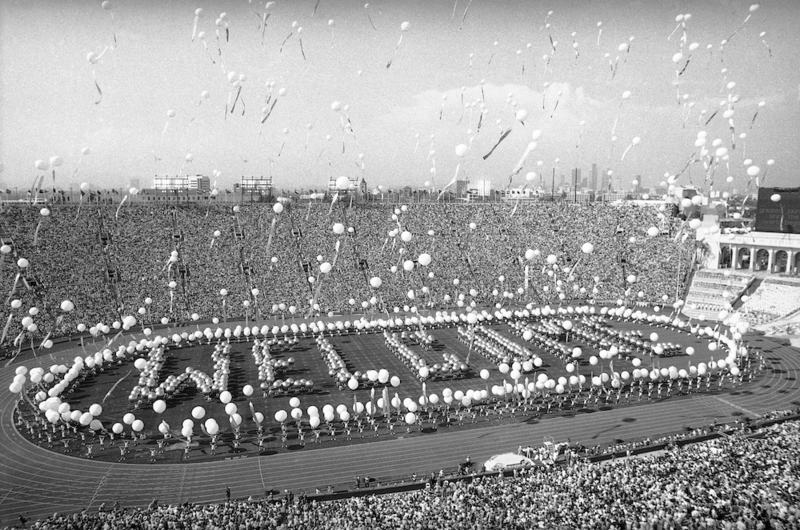 More than 1,000 five-foot helium balloons pulling colorful streamers float upward during the opening ceremonies of the 1984 Summer Olympics at the Los Angeles Memorial Coliseum. Photo by Dave Tenenbaum/Associated Press. With the sixth largest economy in the world, nearly 40 million people and a land area of more than 160,000 square miles, California is larger by far than most countries. It also is a state with a progressive worldview, and an awareness of the government policies needed to realize that vision. To cite just one example, California’s cap-and-trade and alternative energy initiatives address both global warming and local emissions. In 2018 it is possible that voters in the Golden State could begin a process whereby California splits off from the rest of the United States. Stranger things have happened. But there is another, more likely scenario—that of Calternative. The California of high taxes, strict environmental and business regulations, $15-per-hour minimum wages, and exorbitant housing prices has been the subject of an endless stream of articles—too many to cite here—which claim that the Golden State is no longer golden. Their conclusion is that opportunity lies elsewhere. The alternatives to California are supposedly business-friendly states such as Texas and Tennessee. However, in the time of Trump, California also may be a magnet, particularly for creative, productive, outside-the-box Americans, and of similarly minded foreign expats. Calternative posits a possible future in which California prospers even as other states struggle over the next four years. Calternative flows from the notion that economist Charles Tiebout described in 1956 in his Journal of Political Economy article “The Pure Theory of Local Expenditure.” Tiebout’s basic idea was that people choose the local government they want by voting with their feet. It doesn’t happen instantaneously, as people are not entirely mobile, but it does happen: part of the decision on where one lives is what kind of government one wants to live under. In Ernest Callenbach’s 1975 novel Ecotopia: The Notebooks and Reports of William Weston, Calexit occurs, or more precisely LeftCoastExit, and the two parts of the United States go in different directions. Ecotopia is populated by socialists and hippies who create a utopia based on sustainable ecosystems. The author was a great believer in this vision and pushed for at least some version of it until his death in 2012. The book is structured as a report written by a journalist from a future ultra-conservative America, visiting Ecotopia 20 years after secession. Implicit is the assumption that there has been little trade or migration back and forth across the border. In the strange bedfellows camp, Callenbach shares this assumption with conservatives who claim that California is making itself unlivable by adopting a relentlessly progressive social and environmental agenda. Their other shared premise is that there will be little migration to the West Coast; they believe that, compared to California, Houston or Kansas City look good, at least to the real people who start companies and create jobs. But this assumption should be reconsidered, now that State Senate pro Tem Kevin de León, Assembly Speaker Anthony Rendon, and Governor Jerry Brown have vowed to thwart Trumpian policies on climate change, the environment, labor conditions, and gender equality. Washington and Oregon are likely to take similar positions vis-à-vis Washington D.C. Will this lead to an exodus of businesses and the middle class from the Left Coast, leaving behind a moribund economy of the super-rich, hippies, and their servants? In other words, will the fight against Trump help bring about Callenbach’s dream of Ecotopia (18 years later than he predicted)? Creative, entrepreneurial people–those who start companies and create good 21st century jobs—are not lining up to live in Topeka, nor will they. I would submit that this assumption has a logical fallacy. Yes, some may leave California for “business-friendly” states, but many perhaps will migrate in the other direction. Creative, entrepreneurial people–those who start companies and create good 21st century jobs—are not lining up to live in Topeka, nor will they. Edward Luttwak’s brilliant 1994 essay in the London Review of Books predicted the election of a Donald Trump-like leader, a British exit from the European Union, and the rise of populist ideology throughout Europe. His central idea was that creative destruction, the way in which innovation takes a capitalist economy to the next level, may sometimes happen so fast as to cause a backlash. The backlash he forecast would be a longing for the (real or imaginary) economic security of the past, protected and guaranteed by the government. Were that to occur, Luttwak argued, the result would be a stifling of creativity and innovation as firms become more comfortable in their government-provided security blanket and would feel less need to compete with new ideas. But what about those who yearn to step out of the box? That is where The Left Coast comes in. So let’s say you’re comfortable challenging the social and business environment of the day, or that you have the temperament and drive to collaborate with other creative people to translate their ideas into commercially successful products. Where better for you to locate than in a bastion of Trump-defiance? A second source of migration of productive creative people to the Left Coast could result from the social milieu. A society that takes its cues from a president who engages in hurtful talk about gays, women, immigrants, and minorities, people with disabilities, or people of certain religious beliefs, will prove to be uncomfortable at best for those constituencies. California will truly be the Golden State for those targeted by the president—and for anyone seeking a workplace in a more tolerant and pluralistic environment. The Tiebout Hypothesis held that the variety of taxes and services offered by local governments leads to a sorting of the population according to individual preferences. Today’s well-documented sorting of people according to political beliefs is evidence that the Tiebout Hypothesis applies to more than just local taxes and public safety. So sure, people who agree with Trumponomics, or who think California is a bad place to do business, or who just are tired of a state with uber-progressive governmental policy, will leave for states and cities that better match their worldview. That phenomenon is being observed and commented upon across the country; Phoenix, Dallas, and Las Vegas are attracting Californians fed up with high taxes and high housing prices. But the opposite also may be true, particularly with a polarizing President whose supporters constitute a majority in large parts of the U.S. Highly productive people who earn comfortable incomes and can afford to make new homes in California, Washington or Oregon may head West, opting for progressive government, a welcoming and diverse social environment, and greater rather than lesser concern about lower carbon emissions and clean water. The symmetry of the Tiebout Hypothesis—a symmetry that California bashers and Ecotopians alike both miss—may in fact be a Calternative within the United States that produces an expanded creative, entrepreneurial West Coast that remains one of the fastest growing economies of the world. Jerry Nickelsburg, an economist at UCLA Anderson School of Management, writes the Pacific Economist column. He would love to hear from you at Jerry.Nickelsburg@Anderson.UCLA.edu, or via Twitter @jnickelsburg.